Afternoon Meditation, Mabel Dodge Luhan House, Taos, New Mexico, February 2007, photo © 2007 by QuoinMonkey. All rights reserved. In writing practice this morning, ybonesy and I both wrote about sitting in solidarity with our writing friends at the Mabel Dodge Luhan House in Taos. Most Decembers, Natalie holds a writing retreat during the period around December 1st through December 8th. In Zen, this time is called Rohatsu Sesshin and marks the enlightenment of the Buddha, Siddhartha Gautama. Sesshin is about pulling our whole life together — right here into this one body and mind and right here on this little square of black cushion. All of our life, past, present and future, is right here and right now. Our whole life. All our many lives. All of everyone’s life. The life of the planet. The life of the stars. All that we are and all that everyone is and was and wanted to be but couldn’t be. All our successes and failures. All we wanted and didn’t want. All we overlooked and grieved over and lusted over and abandoned. None of that is elsewhere. It’s all right here right now on this cushion. Of all the sesshins of the year this one is the most intense of all because it’s the one…that imitates the Buddha’s time of sitting under the enlightenment tree. So in a way our whole sesshin is a kind of ceremony of enactment of this event and we are all playing the Buddha under the Buddha’s tree, enacting an event that happened almost two thousand five hundred years ago. Two thousand five hundred is just one of the many ways of saying right now. Right now, actually, Right Now, as you are listening to words that I am speaking, Buddha is sitting under the Bodhi tree making strong effort for awakening. In each and every one of your bodies, in each and every pore of each and every one of your bodies, there are infinite Buddhas — each one, right now as I’m speaking, literally and actually making this kind of effort. Slow Walking (left), Winter Fire (right), Mabel Dodge Luhan House, Taos, New Mexico, February 2007, photo © 2007 by QuoinMonkey. All rights reserved. It’s a time of deep practice, a time where we enter the cave-like darkness of winter and look inwardly to the truth of the existence of our own Buddha Nature, and the awakened nature of all beings. Mabel’s Lights II, second in series, Mabel Dodge Luhan House, Taos, New Mexico, February 2007, photo © 2007 by QuoinMonkey. All rights reserved. But sitting in Taos is not about Zen. People of all faiths and religions come to study with Natalie. It is about practice. Beginner’s Mind. About repetition and opening. It is about getting out of your own way, vowing to make greater effort, to go the extra mile, and through that effort, trying to requite a debt of gratitude to those, in life and in Spirit, who have helped us along the way. In Taos, we practice sitting, walking, and writing. We sit like the mountain. We anchor our breath to the bottom of our feet. We chant and sing. We are silent. We write. The practice of our writing is backed by a 2500 year old tradition of watching the mind. It is powerful. At times, life changing. We are grateful to Natalie for creating writing practice, for the gift of her teachings, for passing them down to us. Many of our writing friends are sitting in Taos: sitting, walking, practicing, deepening, learning the true secret of writing. ybonesy and I wanted to hold a place for them. We sit with them in quiet reflection and community. And in doing so, we sit with the world. Not to be attached to external forms, not to be unsettled within, not to think this and that, not to be cluttered with extraneous things, not to think about gain and loss and whether we are happy or sad. This can be called Zen. If you lose the spirit of repetition, your practice will become quite difficult. Key To Mabel’s (in repetition), Mabel Dodge Luhan House, Taos, New Mexico, July 2007, photo © 2007 by QuoinMonkey. All rights reserved. You shouldn’t say anything extra. You should not put any fancy decoration. Mountain is mountain, that’s all. QM…as usual, your photos take my breath away! And I appreciate what you wrote about Bhuddism. My first Bhuddist friend was a wonderful Japanese woman. We became close friends when we lived in the same house, as students at UC Berkeley. We had long talks about religion, and we both realized we had more similarities than differences in our beliefs. Marylin, thank you so much. It wasn’t until about half way through the year long writing Intensive last year that I realized that I could practice my photography as part of the silence, too. It was grounding for me in a different way. And added to some kind of expansion on the ways I see. I think through practice, I might have become a better photographer. Another gift I have received from sitting in silence. I have been feeling so much gratitude this week. The end of the year tends to be a reflective time for me. Just knowing that people everywhere are sitting in silence, observing all kinds of seasonal rituals, makes me feel supported in ways I don’t feel at other times of the year. I didn’t know you went to UC Berkeley. Do tell more about that. It sounds like a great story. I love finding out more about people through writing. Now I’m wondering if you are still in touch with your Japanese friend from school. 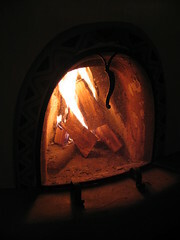 I’m sitting here peacefully tonight, imagining the fire at Mabel’s. Calming. I was out shoveling snow, flakes on tongue, darting like rain. There is magic in the seasons. So much change. It keeps me awake. I wanted to add a few more links on Shunryu Suzuki-roshi before this post rolls on. My research last night led me to cuke.com (LINK): an archival site on the life and world of Shunryu Suzuki and those who knew him and anything else DC feels like – originally a site for Crooked Cucumber: the Life and Zen Teaching of Shunryu Suzuki by David Chadwick. I think Crooked Cucumber is one of the books that the group was assigned for Taos this December. The cuke.com archives is rich with loose interviews, old typed letters, and fuzzy memories of those who knew and remember Suzuki-roshi. Dig around for yourself. The history and uncertainty of memory is alive and well there. this made me want to cry. I’ve been in a cave of stillness of sorts the last three day, and for some reason the knowledge that others sat in the center of that circle I couldn’t seem to get out of changes how I feel now. To feel alone and then realize you aren’t alone… I donno. *laughs*, it makes me FEEL something. QM; We kept in touch for a while, but Haruko and I don’t correspond any longer. She and I were the same age, but our war-time years were radically different, as her family spent the duration in a “Relocation Center for Japanese-Americans.” My time at Cal was one of such tremendous growth; I still draw upon life-lessons gained there. I was an English major. I will never forget what the professor of a course in “Creative Writing” literally blurted out in class one day. “You shouldn’t be here. Do you think the great writers took courses like this one? Never! They were out in the world, experiencing life, living life, observing life around them, listening always!” He is in anguish, I thought to myself. Then, he composed himself and went on with whatever he was saying, I don’t remember, as his words that did stay with me were the most important. This is so evocative and beautiful. I wish I had something that nurtured both my soul and my writing at the same time like this. It sounds so different from the often superficiality and naked competition of a “writing program.” Wish I was there. You are both very lucky to have that. Beautiful photos, beautiful post. What a clean, perfect way to be. I needed this kind of inspiration to begin again, because as a writer I sometimes feel intimidated by the experts out there. The idea that right here and now the Buddha is under the Bohdi tree is a comfort to me. These photos took me back immediately to Mabel Dodge and to sitting with the group. 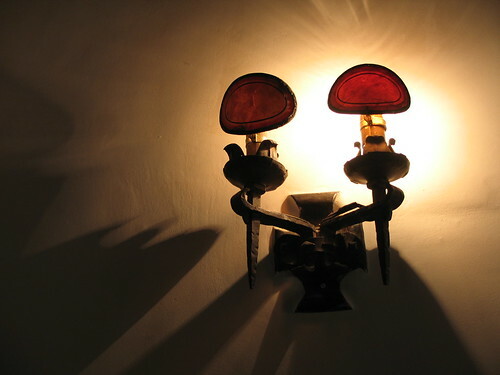 Breathtaking and surprising views of tiny things, like the light fixture next to the fireplace in the main house. 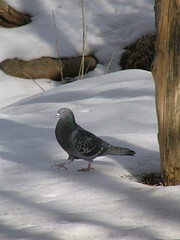 And the pigeons doing slow walking in the courtyard in the snow. Marylin, I remember you mentioning that now, about your friend and the Relocation Center for Japanese-Americans. The camps are one of this country’s best kept secrets. I wasn’t taught anything about them in any of my history classes. Then this year, I had to read and prepare a presentation for Taos on When The Emperor Was Divine by Julie Otsuka. The book was about a family similar to your friend’s. It was 160 pages of excellence. Through Julie’s book and the research for the presentation, I learned so much about the Japanese relocation camps. There is a lot of info out there if people really want to know the truth. I also discovered a book (now out of print) on haiku written by groups of Japanese-Americans (and I want to emphasize that these were American citizens that were being relocated) before and during the camps. I’d have to go back to my research to find the name of the book. I highly recommend When The Emperor Was Divine. I read a lot of the interviews with Julie and the book is loosely based on the experiences of Julie Otsuka’s grandparents and the secrets and shame her family carried from that period in history. If you think about it, a lot of the same types of fear are pervasive in our country today. It’s good to remember the past. We’re a young country. And hope not to make the same mistakes. amuirin and tiv, thank you. Every time we write, we are connected to each other by the simple act of writing. We are all in it together. I’m grateful, too, for all the wonderful connections I have made through writing. QuoinMonkey, this brought me a nice feeling of peace when I read it (both times). The photos, your words, and the quotes…everything. QM, Did you know I’m living just 10 miles from the site of one of those “camps?” There was a total of ten, I believe. We have a lot of information in the Archives on the Heart Mt. Camp. When you come to visit, I’ll take you there. There is already a plaque on a stone that lists the names of the men who enlisted in the Army and served our country, to prove their loyalty. There are annual reunions of former “internees” held in larger cities, mostly in CA, since many returned to the coast. A foundation has been established here, which is raising funds to build a museum on the site. The barracks were all removed; most sold to farmers for storage sheds, but some became homes. In fact, Tracy’s Mother-in-law, my next-door neighbor, is living in one!! (It has had 3 additions to the original structure, one would never guess, by looking at it.) It was a sad chapter in our history. Haruko was a third generation American! As usual, QM, your post is rich, rich with material that we can come back to again and again. Thank you! I woke early on Monday and Tuesday, sat and wrote first thing in the morning. 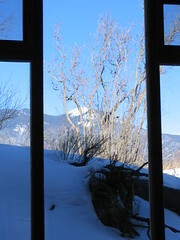 Today I stayed later in bed and was reminded about how I always give myself one day off during the week I’m in Taos, a morning when I skip the optional sit in the zendo. It’s usually Thu or Fri. I’m so disciplined when I’m there. I learned a lot from you in this post about December, and it makes me feel so much more grateful for this month that often makes me sad. The ever-shorter days, the consumerism, the expectations. But now I have something completely different to associate with the month. Thanks. Robin, Elizabeth, C., thank you for your kind comments. What a gift to be sitting and writing with all of you every day. None of us are alone. Marylin, thanks for sharing about Heart Mountain. I’d love to visit Wyoming sometime. And, yes, let’s go there when I do. I think visiting such places and continuing to bear witness moves along the healing. ybonesy, I hope your December is peaceful. This year I’ve made a conscious decision to slow down during December and refill the well. Later in the month, I’m going to a Winter Solstice gathering, and near New Year’s, I’m going to a friend’s home where we are going to sit and make gratitude lists for the year. I’m hoping all of these things open my visioning and dreaming to “right action” for the New Year. I can’t believe another whole year has rolled by. Where does the time go. Thank you for the pictures and the memories. This time a year ago, I was getting ready for the final day in Taos, looking forward to meeting in a small group with Natalie, with the final meditation session, the final slow walk, the last great meal. I remember the laughter, the comradery that came with all of us making through the week of a most unique experience. Jackie from Baltimore, I remember you from last December. How delightful to hear from you. Wasn’t that a magical retreat? Sitting in the log cabin instead of the bigger zendo. That trip to Santa Fe, the lights in the plaza, slow walking the O’Keeffe museum, and writing in the coffee shop. It’s been almost like I’ve been sitting with everyone, too, this week. I am there in spirit. 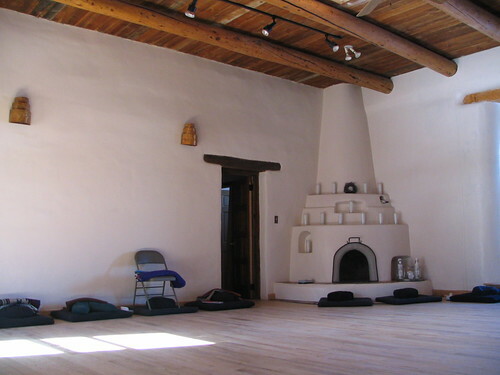 Are you planning to do any other Taos retreats in the coming year? If you stop back by, let us know. And thanks for commenting! When I would drive to Taos for the retreats, I’d leave to drive back to Minneapolis after the silence and not utter a word or turn on any music for hours and hours and hours of driving. I’d forget how sensitive I was until I’d have to stop for gas – then I’d get all irritated at the least little interaction with the rest of the world. It sometimes took me a few weeks to ease back into the pace of life we all keep these days. Did you ever feel that when you had to step back into the world after the silent retreats? Yes, I often felt sensitive, although I also mostly had to push that sensitivity aside being as how I was almost immediately confronted with my life — husband, daughters, dogs. I adjusted quickly to my “normal” life. I would have enjoyed a long (multi-day) drive back to somewhere. Teri — who attended the workshop — was so kind as to send me this reading list that Natalie gave the attendees beforehand. Teri gave me permission to share it with the blog community. Thanks, Teri. Several of the books landed on my Christmas wish list! I picked a DVD off the shelf at the local library a few days ago, “Willa Cather, The Road is All.” I was riveted to the 90-minute documentary of her life, from Virginia to Nebraska to the East, and including her multiple trips to New Mexico to gain perspective and insight. 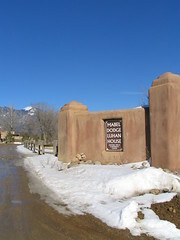 Willa stayed at the Mabel Dodge Luhan House, and a guest room is named after her. The film captures the writer’s journey, the road traveled through plenty of darkness. I am completely inspired to read more of her work. Sinclair, the Willa Cather DVD sounds excellent. I remember that she was born in Virginia. Hey, is there a Virginia birth house featured in the film? It would be cool to see it. I still want to get down to Red Cloud to see her Nebraska roots. I stayed in the Willa Cather room in Taos at Mabel Dodge my very first time there for a writing retreat. I was scared to death. I had no idea yet if I was a writer or not. I had a roommate from Colorado that I didn’t know before we met that night. She turned out to be pretty great. I wonder where she is now. Or if she ever returned to Taos? I remember the Cather room is small and intimate. With a huge tiled shower. I didn’t know much about Cather when I stayed in that room. I know so much more now about the amazing woman she was. I’ll have to check out that DVD. What surprised you most about what you learned on the DVD about Cather? Each time I read or watch tidbits of other artists and writers, my own creative life becomes more alive. There is a house in Virginia pictured, but I got the sense it was a generic Southern house…not necessarily her family’s house. Her home in Red Cloud is clearly shot, including the bedroom she had to herself (her four brothers all shared one room). A few things surprised me in the DVD. Willa was wildly criticized by her writing contemporaries, even after she won the Pulitzer for “One of Ours.” Hemingway was especially harsh. Her books were very popular and she became rich. Perhaps they were jealous. Another thing that I didn’t know was that after her Nebraska masterpieces she went through great doubt and felt lost in her work. She had to continue to take leaps in her writing. I hope you make it to Red Cloud, QM. I’m thinking of going there myself. Cather’s 4 brothers shared one room? That sounds like our home growing up. My sister and I shared one room. And my 4 brothers shared another. I remember my step-dad built two sets of bunk beds so they could all fit in that tiny space. I don’t know how they did it! I remember reading (maybe on the Cather site) that other writers were extremely critical of her work. But I hadn’t remembered about Hemingway. Now that I think of it, Hemingway was critical of *everyone*. Remember how he tattled on his friends (like Gertrude Stein) and railed on Fitzgerald (and others) in A Moveable Feast? I just think Hemingway was not a very nice guy. I had no idea about Cather’s dark night of the soul around her writing. Sometimes you wonder what it is that keeps creative people going. There is so much Monkey Mind involved in being a writer or artist. It takes daily effort to keep the confidence up. Well, I guess we know where Hemingway’s way of being in the world got him. Seriously, I don’t know how writers think they can get by slicing and dicing each other. Don’t they know that what goes around *always* comes around? The bedrooms in the Cather house looked sooooo appealing. The boy’s room is a cozy little space with four twin beds in a row. Willa’s looked like a writer’s studio–room, light, silence. In my opinion, those old-fashioned houses have everything on the bland boxes they build in housing developments these days. Yes, I guess we may as well accept Monkey Mind’s residence in our lives. I got two rejection emails back-to-back this morning from editors, so the voices in my head are at a fever-pitch as I type this. Sinclair, sorry to hear about the rejection letters. I just want to say, I think you’ve got courage for even submitting your work and risking rejection in order to get it out there into print media. It’s something I’m working on in 2008. One of my Visions is to submit pieces for print publication. I started a piece last week that I’m working on. We’ll see what happens with it. About Hemingway, you know what’s strange? I just sat down for lunch and picked up The Best American Essays 1999 that Liz gave me for Christmas. She chose it because it has essays by Joan Didion, Annie Dillard, and Arthur Miller, to name a few. Anyway, I started reading the Joan Didion essay Last Words and it was about Hemingway. I’ve got a new empathy for Hemingway after reading her piece. She does talk about his larger-than-life ego and love of his own celebrity. But she also talks about his love of words, and place, and how he made the English language new in his own time. She also talks about the end of his life: his depression, the shock treatments at the Mayo Clinic in Rochester, Minnesota in the months before his death, and his July 2nd, 1961 suicide. But the real thrust of the essay is about authors’ letters and works being published after their death and against their wishes. Hemingway didn’t want his letters published. Yet literally hundreds of them are in print. It’s kind of the other side of the coin of wanting something to be published so badly – and then not wanting other things to be published – drafts, letters, notes, etc. I remember that Willa Cather didn’t want her letters published either. She asked that they be burned. I wonder if her request was truly honored. Or if there are letters out there somewhere. Wow, I didn’t know all that about Hemingway. He must have been desperate to subject himself to shock treatments. Time to cut Ernest some slack. There was much said in the DVD about Cather’s letters. They were all burned. The “Willa Cather Biographers” they interviewed in the movie all verified it. However, one of Willa’s earlier books was made into a movie (the name escapes me now), and Willa was mortified by the picture. She vowed none of her books would be made into movies again. I know that wish hasn’t been carried out–I’ve seen “O! Pioneers!” many times. I was going to do the Stephan King thing with rejection letters, but the amount of paper became too unwieldy. That gives you an idea of the number of rejections. However, despite the pounding voices, I have continued writing today–a political essay inspired by the primaries in Iowa and New Hampshire. Sinclair, amazing that they were all burned. Cather’s partner did a better job at honoring her request than Hemingway’s 3rd or 4th wife (I can’t remember which right now) did in honoring his. I want to pick up the DVD “Willa Cather, The Road is All.” You’ve inspired me. Funny you should mention politics. I can see why you wuld be inspired. The primaries have been fascinating. And ybonesy and I were just talking this morning about doing a few light political posts on red Ravine (as they relate to our own lives). About the rejection letters – continuing under all circumstances is the only thing we can do, even in the face of rejection. The pounding voices will recede and diminish in the face of passion for the writing. I believe it. I took myself on an Artist’s Date tonight to the BookHouse, a classic used bookstore in Bob Dylan’s old University neighborhood. I found a copy of Cather’s My Mortal Enemy. It is thin, and short, and fits just right in my hand. I think I’ll read it. S-l-o-w-l-y. Sinclair, I just read the part about your writing a political essay. I think it’s great that you’re writing about politics. There’s a lot of passion there. I’m resurrecting a piece I wrote during the Bush/Kerry campaigns four years ago. Remember how fueled up everyone was? This election has the same amount of passion, but it is different somehow. I haven’t put my finger on what the difference is yet. Anyway, I’m enjoying adapting the piece for now. Keep your eyes on New Hampshire! I can’t wait to see what happens.